If you're planning to buy a OnePlus X, you may want to do it now, as OnePlus is currently offering a free case to anyone getting the smartphone (as long as supplies last). 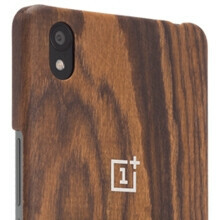 The case in question is the Rosewood model, which normally costs $24.99. The offer is part of a Valentine's Day promotion, so we assume it's going to last at least several days (if not until February 14). To take advantage of this offer, you must visit the official OnePlus online store (see the source link at the end of this article), and add both the OnePlus X and the Rosewood case to your shopping cart. After that, enter the promo code "XOXO" (that's hugs & kisses in internet language), and you should receive a $24.99 discount - thus, you'll only pay for the OnePlus X, which costs $249. Sure enough, this is not an earth shattering offer, but, hey, free accessories are always welcome. As of last week, the OnePlus X is available to buy without invite. The smartphone comes with plenty of attractive features for its price, including a body made out of metal and glass, a 5-inch 1080p display, a fast 13 MP rear camera, and 16 GB of expandable internal memory. For more details on the handset, read our OnePlus X review.